A Board of Review has not approved this Summary Report. It is intended as a safe ty and training tool, an aid to preventing future occurrences, and to inform interested parties. Because it is published on a short time frame, the information contained herein is subject to revision as further investigation is conducted and additional information is developed. 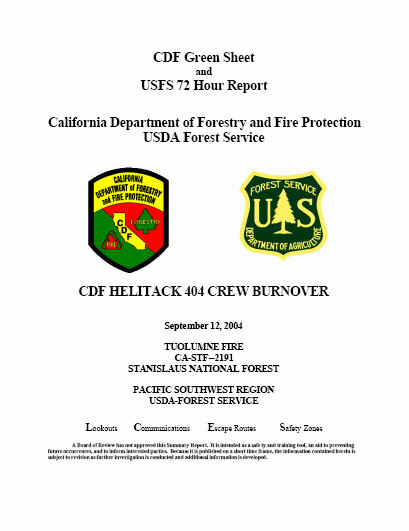 On September 12, 2004 at approximately 1345 hours seven members of CDF Columbia Helitack (Helicopter 404) crew were burned over while constructing fireline from Lumsden Road downhill to the Tuolumne River on a steep slope (80-120%). The fire was located near Lumsden Bridge in the bottom of the Tuolumne River Canyon. The crew had been dropped off by Copter 404 on a gravel bar in the river approximately ¾ mile downstream from the fire. The crew met the incident commander (IC) on Lumsden Road before reaching the fire. The helitack captain (HC) received a strategy briefing to establish an anchor point on the right flank. He walked to the fire’s edge and assessed the area below the road. After discussing the assignment and safety issues, the crew members began constructing indirect handline (7 to 30 feet from the fire’s edge) downhill using a chainsaw and hand tools in an oak overstory with brush fuels. The fire was backing into an up-canyon wind. A wind shift occurred causing the fire to change direction and spread upslope into the crew. Three members of the crew simultaneously shouted the alarm. All members of the crew ran toward identified safety zones. Four members of the crew, including the captain, went down to the river; three went up toward Lumsden road. The four firefighters (FF) that went downhill reached their safety zone. Of the three firefighters that went uphill, FF#1 and FF#2 made it to the road. FF#3 was last seen by FF#2 immediately behind him approximately 5 feet from the road. FF#3 did not reach the road. Firefighters on-scene estimated the elapsed time from the wind shift to the burn-over was less than 30 seconds with the total wind event lasting less than 2 minutes. Fire shelters were not deployed. After reaching the safety zones a crew count determined that FF#3 was missing; an immediate search was begun. FF#3 was located; she was obviously deceased. The other helitack firefighters received minor to moderate injuries. They received immediate assistance at the scene and were transported to medical facilities in Modesto and Sonora. The fire location is in Tuolumne County at the bottom of the Tuolumne River Canyon (1450’ elevation) about three (3) miles east of Groveland, California. The Tuolumne River Canyon is a major Sierra Nevada river drainage that has very steep canyon sides and is 2,000 feet deep at the accident site. The fire originated near the river ¼ mile downstream of the Lumsden Bridge. The fire was first reported by The Stanislaus National Forest (STF) Duckwall Lookout at 1233 hours. STF dispatched a standard wildland fire response. Copter 404 was dispatched to the fire at 1245 hours from their home base in Columbia, California (22 miles northwest of the fire). CDF Air Attack 440, 2 airtankers, and the IC were already at the scene upon the arrival of Copter 404 at approximately 1305 hours. Copter 404 is a UH-1H Super Huey (type 2) helicopter with a crew of nine, consisting of a pilot, two helitack captains, and six firefighters. After dropping off one helitack captain and six firefighters at a landing zone (LZ) about ¾ mile southwest of the fire, the pilot and one helitack captain remained with the copter and began making water drops up the right flank. At the time of the burn over Copter 404 was working a spot fire off the left flank of the fire. The crew walked along the road from the LZ to the right flank of the fire (the fire was burning above and below the road). The helitack captain met the IC at Lumsden Road near South Fork Campground and received a briefing on fire conditions and proposed strategy to anchor the right flank. The crew continued up the road to the right flank, evaluated the situation and the proposed assignment to anchor the right flank at the river. Lumsden road parallels the river. The slope distance is approximately 260 feet from the road down to the river at the accident site. The fire was burning upslope from the river with minimal lateral spread on the right flank. The right flank was backing into a light up-canyon wind with flame lengths of less than 12 inches. During the initial attack, the fire was spreading in light, flashy surface fuels. The fuels were predominately live oak leaf litter, light grass, and mixed brush, with an oak overstory consistent with Fuel Model 2. One-hour fine dead fuel moisture was estimated at 4-5%. Live fuel moisture values at the accident site were unavailable and no representative values were available at the time of this report. The Tuolumne River Canyon is characterized by a meandering river channel with numerous tributary canyons and ridges with slopes ranging from 80-120%. The fire started below Lumsden Road on the south side of the river (north facing slope). Wind: Predominately steady up-canyon, estimated 3-5 mph (generally WSW). Prior to the burn-over numerous observers (AA, C404 pilot, IC, crew 404) reported that the wind had remained light and steady flowing in an up-canyon direction. The tactic selected to establish the anchor at the river was indirect line construction to take advantage of sparse fuel and natural barriers. Five backpack pumps were staged on the edge of the road. The crew began using one chainsaw and handtools to construct line downhill from the road to the end of the vegetation (slope distance of 180 feet). The fire was backing into an up-canyon wind. The initial point of the handline was approximately 7 feet from the fire’s edge at the road; as the handline progressed, the distance from the edge of the fire widened to approximately 30 feet. After line construction began the firing out operation started. At approximately 1345 hours an abrupt wind shift occurred. The 90-120 degree windshift changed the fire spread from a cross-slope backing fire to an upslope head fire. The wind event triggering the flare-up lasted less than 2 minutes and the actual flare-up lasted approximately 30 seconds; then fire behavior returned to a backing fire influenced by the up-canyon wind. The crew’s tool order consisted of FF#6 (chainsaw), FF#5 (swamper), helitack captain (HC) with scraping tool, FF#4 (scraping tool), FF#3 (scraping tool), FF#2 (scraping tool, fusee, and handie talkie ), and FF#1 (back pump). The chain saw cut line extended approximately 120 feet and the scraped portion extended approximately 40 feet. At this point FF #2 had fired out approximately 10 feet of line. The HC directed FF#1 to retrieve a backpack pump to support the firing operation. FF#1 returned to the road to put on the backpack pump. FF#2 stopped firing and was standing next to FF#3. STF Engine 43 had arrived at a turn-around on Lumsden Road down canyon ¼ mile from the accident site. The captain and a firefighter from Engine 43 walked the road from the turnaround to the right flank and arrived seconds prior to the burn over. FF#5 noticed a wind shift and saw a sheet of fire coming upslope toward him and yelled to FF#6 to go downhill. Simultaneously FF#2 warned of the wind shift and turned uphill along with FF#3 and began escaping up to the road (approximately 20 to 30 feet away). HC yelled a warning; FF#4 saw a hole in the flames and ran downhill through the fire followed by the HC. FF#1 heard yelling and turned to face the hand line. He saw a run of fire heading up the hand line and yelled for the crew to get out of there. FF#1 saw the lower crew members scattering downhill. FF#2 rolled over the lip of the road within the oncoming flame front as the fire hit the road. Although FF#2 and FF#3 were together within 5 feet of the road, FF#3 did not arrive at the road. FF#1 ended up on the road to the southwest toward STF Engine 43; FF#2 rolled into the inside cutbank of the road, jumped up and ran into the black staying on the road. After going through the flames, FF#4 rolled down the steep rocky embankment toward the river. HC, FF#5, and FF#6 ended up in the safety area at the river. During this event the STF engine 43 captain and firefighter backed off toward the turn-around. HC identified FF#4, FF#5, and FF#6 along the river and contacted FF#2 by radio. The two separate groups did a crew count and discovered that FF#1 and FF#2 were accounted for and FF#3 was missing. They began an immediate search and called for bucket drops and assistance in the search. Copter 404 responded from the spot fire on the left flank, refilled the bucket near Lumsden Bridge, and flew ½ mile west to the accident site. When Copter 404 arrived, the fire behavior had subsided to its previous backing condition. Copter 404 began making bucket drops to cool the area so the search could proceed. As the heat and smoke conditions subsided HC, FF#1, FF#2, FF#5, and FF#6 began a grid search. Engine 43 arrived at the right flank to assist in the search. As the smoke cleared and bucket drops cooled the area, the searchers discovered the body of FF#3 located in the newly burned area approximately 100 feet below the road. HC had minor burns to the head and face. FF#1 had no reported physical injuries. FF#2 was treated for smoke inhalation and minor burns. FF#4 was treated for one fractured ankle and one broken rib; one twisted ankle, and abrasions. FF#5 had no reported physical injuries. FF#6 had no reported physical injuries. All surviving crew members were transported to hospitals for observation and treatment.